Panelists greeting fans after talking about how their ventures in the tv and film industry has influenced their lives and how they work to help make a positive difference in society. United4:Good booth for Stan Lee’s Comikaze 2015. 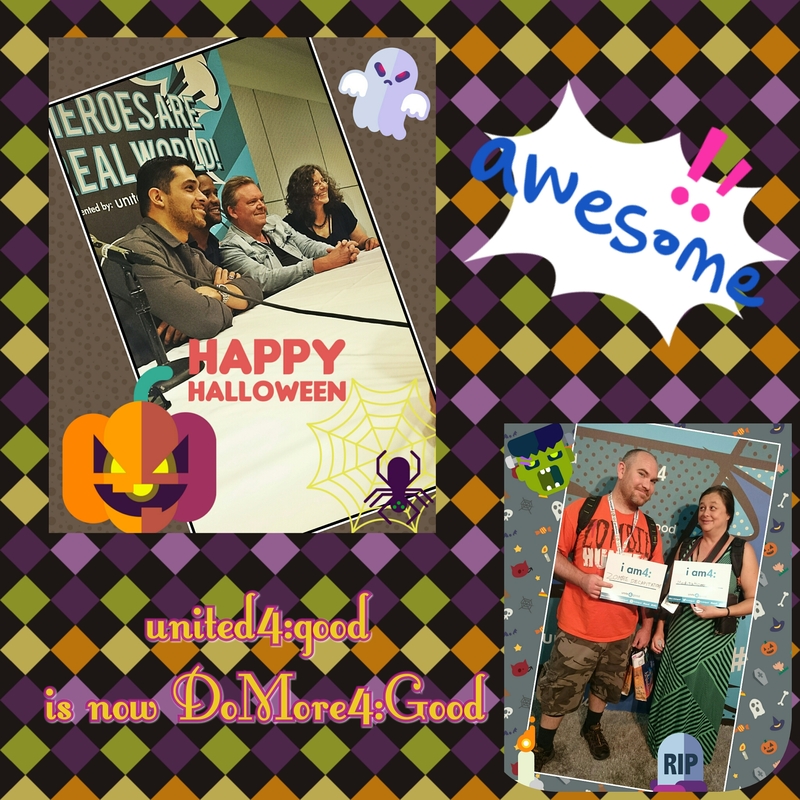 The former unite4:good has now become DoMore4:Good. This nationwide nonprofit organization works to “help make the world a better place” and motivate people to do what they can to help make a positive difference in society. Stan Lee’s Comikaze 2015 has come together with the organization, along with Wilmer Valderrama (Minority Report TV Series) and Blair Underwood (Agents of S.H.I.E.L.D.) to speak with Trevor Goring (Artist and Illustrator) and Dr. Robin Rosenberg (Psychologist and writer of “What is a Superhero?” and “Our Superheroes, Ourselves,” etc.) about how we relate to the superhero persona and how performers who portray those superheroes even help to motivate others to do good in the world. “At their best, superhero origin stories inspire us and provide models of coping with adversity. Find meaning in loss and trauma, discovering our strengths and using them for good purpose,” said Dr. Robin Rosenberg, ‘The Psychology Behind Superhero Origin Stories’ article in Smithsonian Magazine (2013). Consider all of your personal aspects and how to use them as a power for good. Exercise those talents that are above average skills that you possess in order to find the Super within yourself. The smallest of actions can change the world. Often times, when we are doing something so extraordinary, we don’t even realize that we are actually doing something so grandiose as the effort is being carried out. Sure, the heros we grew up with are so admirable because they posses powers that expand our imaginations and break realistic limitations, but the mind proves to allow us the ability to surpass these limitations in life in order to exceed all expectations and go beyond limitations of the present and potentially leave a legacy of good for everyone to benefit from. Our mind is an amazing mechanism. Regardless of the limitations placed upon us, our weakness are proven to serve as strengths when we pay enough attention to who we are and adapt those characteristics to allowing us to function at your highest potential. DoMore4:Good inspires people to come together to inspire people to keep dreaming and aspiring for greatness in order to make the world a better place. Exercise empathy, remove segregation, and realize that we are united and a part of each other. “I think the overall theme to this is to find what you can within yourself to find those heroic powers or dynamics within yourself to give back, pay it forward and help other people,” said Blair Underwood. Being of service to others is the main goal. For more information about DoMore4:Good, visit https://www.facebook.com/domore4good/ or visit united4good.org or u4g.com as they transition to into their new image.